Baby Bliss with Jordan & Chris: The Nook on POPSUGAR! Living at our condo with Eloise as a baby seems like a hundred years ago but our creative solution to giving her her own space is still getting people's attention. 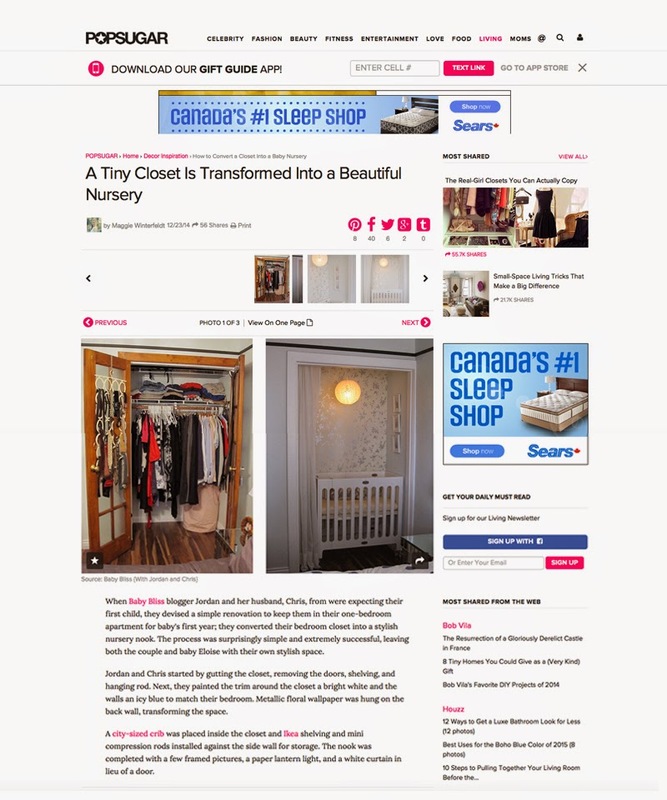 A month ago I was contacted by an editor at POPSUGAR who asked to feature our Closet-to-Nook conversion and it is so cool to see our little project this week on such a widely read website. The response to our Nook on POPSUGAR's Facebook page was quite fascinating. Some people loved loved the idea, some people hated it and one reader commented that we should be put in a closet for suggesting a baby sleep in there! Ha! The other thing I noticed was people's concern for safety, especially with infant dangers like SIDS. Like any other parent, I would never do anything to compromise my child's safety and the truth is, Eloise's Nook was more of a space solution for only a short period of time. Her crib wheeled out of the Nook for sleep - providing proper airflow - and tucked neatly away when not in use. We knew that we would not be living in our condo forever and I was confident that by the time Eloise was reaching and able to stand she would have a larger space; therefore things like pictures about the crib (which, for the record, were firmly affixed to the wall) and a drape would never pose danger or be a strangulation hazard. Discussion aside, it is super cool to see that our project can open people's eyes to small space solutions with children. Even now, we manage quite nicely in under 1000 square feet as a family of four. Maximizing space is about being creative.